The photo of the two monks above looks innocent enough. One of the men presents the other with a birthday present. It’s difficult to make out, but it looks to be some sort of gold figurine on a red velvet base. In fact, the photo would be totally uninteresting if it weren’t for the fact that these men are two of the world’s most important leaders of a dangerously radical brand of Buddhism. The man on the right is Burma’s Ashin Wirathu. Known as the “bin Laden of Buddhism,” Wirathu leads the country’s 969 movement, which sees the country’s Muslim minority as an existential threat to its majority Buddhist population. 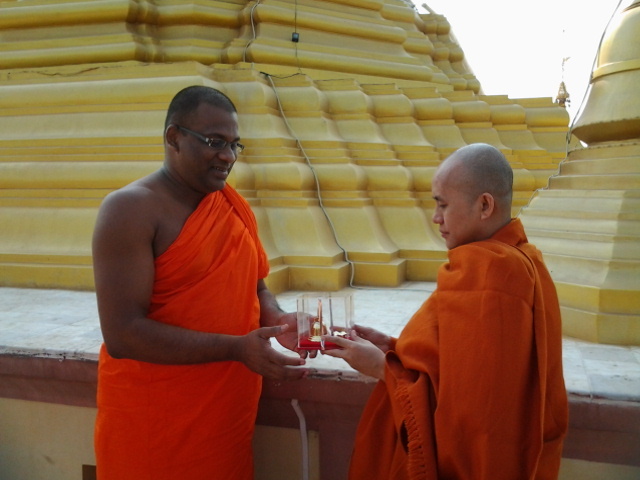 The man on the left is Sri Lanka’s Galagoda Atte Gnanasara, the face of hardline Buddhism in the island nation. You Want To Know What Impunity Means To Poor People In Rural Sri Lanka?